Determining whether a crown or a filling is necessary is not always completely straightforward. In some instances, the best choice is a partial crown, referred to as an onlay. The dentist will ultimately make a recommendation based on a variety of factors like the amount of tooth remaining after the old filling and decay are taken out. Here is a look at some of the top considerations when deciding between a filling and a crown. The stability and health of the leftover tooth structure matter a great deal. If ample tooth remains and it is in good shape, a composite filling will prove to be a durable solution. If the leftover tooth is fragile, a partial crown or a full crown can act in place of the tooth structure. The crown will also bolster the tooth's strength against fractures. If a tooth fracture occurs, a root canal might be necessary. In the worst case, an extraction will be necessary. If there is a good chance the patient will suffer tooth fracture or decay, there is also a heightened chance of cavities. Others are especially hard on their teeth or have a heavy bite. A crown makes the most sense in these instances as a filling has the potential to fracture and spur tooth loss or root canal therapy. A crown is a porcelain or ceramic prosthetic tooth that fits over the current tooth. If a patient decides to choose a dental crown and properly maintains it, then the dental crown has the potential to last upwards of a decade and a half, if not longer. 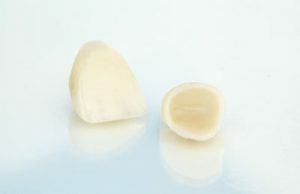 We can also combine crowns with bridges to provide additional stability when chewing and eating. Think of crowns as ideal for instances of considerable tooth decay and fillings as a means of restoring teeth with less damage. Another difference between these two oral health solutions is that we do not remove any tooth material when adding a dental crown that rests directly over the tooth. A filling involves the removal of decayed tooth material, a cleaning of the tooth and then placing the filling. Fillings are ideal for people looking to maintain as much of their natural tooth structure as possible. They seal the tooth better than many other oral health solutions and also provide the stability that wards off fractures and splitting. Patients who need minor improvements will benefit from a composite filling material that bonds to the teeth and enhances their visual appeal. Fillings consisting of composite resin have the appearance of regular teeth. Thus, there is no reason to worry about the appearance of your teeth following a filling. The end result will be a lovely-looking mouth with visual uniformity and symmetry. No one will have any idea you have a filling unless they are within inches of your teeth. Call Active Dental to schedule a dental appointment in our Irving dental office.